Trying to uncover a customer’s pain points is a mistake that’s not only costing companies a ton of money in terms of lost revenue and missed opportunities, it continues to be promoted amongst sales teams all over the world. “Easing a customer’s pain” may seem like a nice gesture, but the notion of probing for pain (only) contains two illogical flaws in today’s selling environment. First, focusing on prospects who are currently experiencing pain significantly reduces the size and scope of your target audience. While everyone agrees that people who are ‘in pain’ are indeed motivated to find solutions, it turns out that decision makers and influencers are just as motivated to purchase products and services because of many other factors. Technology titan Apple, for example, has sold over a billion (with a “B”) iPhones since 2007, and they generated $9+ billion in iPod revenue before that. How many iPods and iPhones do you think were purchased because the customer was in some sort of pain? It turns out that customers purchases products and services based on a wide range of decision factors. Whether you sell technology solutions, manufactured goods, employee benefit packages, or healthcare services, the decision to acquire your product or service may be driven by something as simple as the desire to achieve a goal or satisfy specific business objectives. Potential buyers can just as easily be motivated by wants, needs, or an opportunity to improve their existing condition. So, why would you want to limit the size of your audience to only focus on customers who are currently experiencing pain, when the larger opportunity includes prospective buyers who are just as driven to acquire solutions to address any number of other wants, needs, goals, objectives, and desires? In addition to limiting the size of your target market, the second flaw with the strategy of uncovering the customer’s pain points is that it can come across as highly offensive to the people you are so desperately hoping to influence. If you call on customers who are either territorial or proud of the work they do, good luck bonding with them by trying to expose their flaws, faults, and deficiencies. Before you start dialing the phone, or begin crafting a bunch of clever one-liners to take out into the field, it’s important to recognize that an effective needs development strategy requires more than a single ‘magic’ question. That’s why I’ve written multiple books on the subject. For our purposes here, I’m merely pointing out that “probing for pain points” is one of the most common mistakes sales teams make. On the other hand, salespeople who focus on helping their customers satisfy a broader range of goals, wants, needs, and objectives can significantly increase their own sales results. Here’s the best part. Exploring decision drivers that extend far beyond just uncovering “pain points” is actionable on your very next customer call—that is, if you are open to a couple ideas. How’s Your R-O-I-S-E (Return on Invested Sales Effort)? Most customers focus on 3 letters when making important purchase decisions. At the end of the day, they will choose whichever product or service they believe provides the greatest return on investment (ROI). 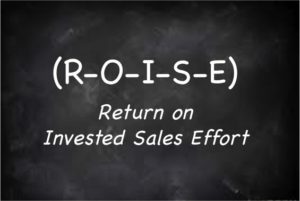 Sales organizations, on the other hand, should focus on 5 letters, those being: R-O-I-S-E (Return on Invested Sales Effort). Too often people refer to the familiar theme that sales is a “numbers game.” While I agree that tracking activity & results is, and will always be, an integral part of managing sales teams, simply pressing salespeople to make more calls in an effort to fill the pipeline ignores the most important metric in any business—sales efficiency. Now that the average success rate for sellers leaving voice-mail messages or sending email solicitations has dropped below 1%, rather than just ‘banging the phones’ and hoping for the best, one has to wonder why there’s not a greater focus on the notion of increasing sales effectiveness. The ‘number’ sellers should really focus on is conversion rate. What if were possible to get a 30%, 40%, or 50%+ response rate when reaching out to new prospects, as opposed to a 1% return on your invested sales effort? Similarly, what if you could accelerate the sales cycle, create a greater sense of urgency, maintain higher margins, and improve your closing ratio? Relying on sales tricks or gimmicks to boost performance is unsustainable in today’s competitive business environment. But show me someone who is not only focused on sales efficiency, but knows how to execute more effectively, and I will show you a top performer in any company or industry. This question is not only easy to ask, it’s easy to answer—typically with a “Yes.” In Question Based Selling, we call this securing a mini-invitation. Once the customer says, “Yes,” “Sure,” or gives you any other affirmative response, they have essentially invited you to ask questions. Bingo! By securing a mini-invitation to ask questions, you can expect to get more information, in more depth, that’s also more accurate. 2.) Trying to Indict the Customer… Seriously? Sellers offer solutions to solve problems. And, in order to actually solve a problem, you first need to know what issues the customer is currently experiencing. Trouble is, the issues or problems customers face are oftentimes self-induced. While the typical sales mindset is to ‘uncover’ the customer’s needs, there are plenty of occasions where decision makers aren’t excited about exposing their vulnerabilities. One of the best ways to sidestep the risk of asking overly rhetorical sales questions is to ask “to what extent” a certain topic is important to the customer or needs to be further explored. For example, asking if ‘reliability’ is important to a customer sounds silly. Of course reliability is important! I would be more inclined to ask, “To what extent is reliability important?” Asking the customer to quantify their perspective on relevant topics is one of the simplest ways to remove the “Duh!” factor. Another risk reduction technique is simply to ask, “Besides the obvious goals of ____, ____, and ____, what else are you concerned about?” Fill in the blanks with three topics that are relevant to the target industry, and the pride factor that so often causes people to be guarded in their responses is more likely to generate the opposite reaction—where customers open up and share tons of valuable information. Bottom line: Just ‘probing’ for needs is intrusive and laced with risk. A strategic approach to needs development gives savvy salespeople an opportunity to increase their R-O-I-S-E by raising potential issues, objectives, goals, wants, needs, and desires that the customer may not have otherwise considered. In fact, helping potential buyers better understand their needs is one of the greatest opportunities sellers have to add value throughout the sales process. Too often, sales teams wait until the end of a fiscal period before they shift into high gear, and ‘push the pedal’ all the way to the floor, in an effort to boost results. Since the day of reckoning is surely coming, however, why wait until your back is against the wall to ramp up sales productivity? It would be optimistic to hope enough deals would simply materialize out of thin air to make your numbers before year-end. It’s more likely that whatever business you close in the coming months will be a direct result of the level of effort you put forth in the coming weeks–to cultivate new prospects, nurture qualified opportunities, and ultimately, bring deals to fruition. So, why delay? 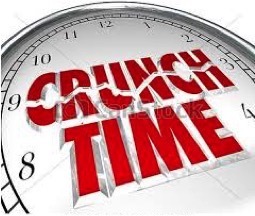 Crunch time is…NOW! How many voice-mails have you deleted, or email solicitations have you trashed, in the last few weeks without listening to the entire message, or reading past the very first sentence? A bunch? That’s because traditional ‘cold calling’ tactics are no longer cutting it, and continuing to sound just like everyone else who is knocking on your same door list of target accounts has become somewhat of a futile exercise. Fortunately for those who are willing to step outside the box of traditional sales thinking, there is an antidote for customer standoffishness—curiosity. If a key decision maker in an important target account is not the least bit curious about who you are or what you can do for them, it’s highly unlikely that you will get an audience with them. On the other hand, as prospective buyers become more curious about how you can add value, that’s the ticket to securing a precious slice of their time and their attention. So, what are you doing to ‘leverage curiosity’ in the sales process? If the answer to that question isn’t clear, whether you prefer books, audio, or on-site training, I’ve spent the last 20+ years teaching sales teams how to gain an ‘unfair’ advantage in terms of penetrating more new opportunities. Trouble is, important sales attributes like credibility, integrity, and thought leadership are not just something that can be indiscriminately claimed. They must be earned, which is why it’s crucial for salespeople to understand how to convey more intangible value than the competition, throughout the sales process. Strategic deals generally require a series of smaller sub-steps on the way to consummating a mutually beneficial business transaction. As a result, your ability to secure those initial and secondary commitments are often just as important as wrapping up the final deal. What’s the best way to secure these smaller commitments? One option is to try and push customers to move forward. Another is to beg. The best option to move your opportunities forward is to use of superior closing technique. If you treat the mid-summer months as “crunch time,” and focus on increasing your sales effectiveness in each of these areas, the seeds you sow in the near-term should put you in a strong position to far exceed your numbers by year-end. It’s ironic that the sales training world has stayed pretty much the same over the last 20 – 30 years, while for most companies, the selling environment has changed dramatically. Consequently, it has become more difficult for sellers to penetrate new accounts, while potential buyers are often working even harder to keep salespeople at bay. There’s no point in blaming the customer. Over the past decade, corporate decision-makers are being asked to achieve more in less time, oftentimes without the benefit of additional resources. Meanwhile, while workloads continue to increase, competitors are getting hungrier, and the overall pace of business has quickened. Even if they wanted to, customers simply cannot afford to spend time with every salesperson that comes calling.